Anyone interested in weavers, the ADU Virtual Museums, or citizen science is welcome to attend! See all PHOWN records of weavers at Intaka here. Bird hides and a high density of birds provide photographers ideal opportunities to take photos of birds. So much in fact that there is a facebook site dedicated to photos of birds (and other wildlife) taken at intaka - see here. Scroll down here on the Intaka site for plant and bird lists: here. The programme will include a variety of talks, field sessions, and workshop time. Provisionally, the formal programme will start at 9h00 and run until 15h00. The draft programme is below (the sequence of talks may still change). 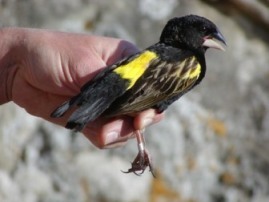 The outing will be a bird ringing session at Intaka, from 6am to about 11 am. Arrive and leave anytime in the morning. Bring your own refreshments and a folding chair if you want to sit while watching the ringing. Weather is expected to be warm to hot, and some wind. More details will be provided at the conference. until 25 Jan 2013 - late registration - entry fee (R10) and refreshments will be at own cost - please let me know that you are coming, however. Abstract. Structures built by animals, such as nests, mounds and burrows, are often the product of cooperative investment by more than one individual. Such structures may be viewed as a public good, since all individuals that occupy them share the benefits they provide. However, access to the benefits generated by the structure may vary among individuals and is likely to be an important determinant of social organisation. Here we use the massive, communal nests of sociable weavers, Philetairus socius, to investigate whether their thermoregulatory function varies in relation to the size of communal nests, and the position of individual nest chambers within the communal structure. We then examine whether this spatial variation in thermoregulatory function predicts the social organisation of colonies. This map shows how to get to the parking area outside of Intaka Island, from the N1 south of Century City.